Only those players on a College Baseball roster will be eligible to play in our summer collegiate program. Because we are in very competitive leagues, it is imperative that our rosters are composed of active college players. Player who are not on a college roster may still sign up for our program, but will be placed in a less competitive situation. Graduating high school seniors who play varsity baseball are also eligible to play in our program. In addition to playing (20) league games, we will play an additional (16) games, including a local tournament, non-league games and one (1) out of town 3-4 game series. The season will begin Memorial Weekend at the end of May, and conclude end of July. If we quality, the post-season playoffs will begin the last weekend in July and our goal is to participate in the Stan Musial World Series. Hitters who will put the ball in play and play our style of play on offense; smart ball. Hitters who have a low strikeout rate. Players who make all the routing plays on defense. Players who are committed to be at every scheduled game and practice (90%) rule. Players who believe in the philosophy, "the team comes first." Players who understand that our team plays the game the right way, respects the game, coaches, teammates, opponents, umpires and fans. For all local games, players are expected to report at least (90) minutes prior to opening pitch. Sometimes batting practice will be available, either on the filed or in the cages. All players will be expected to turn off their cell phones when they get to the field. No texting or cell phone use are allowed by players once you get to the field. Because NBC Collegiate baseball requires a huge commitment, only serious baseball players need apply to our program. We expect each player at every scheduled game and practice. Summer baseball must be your priority. Work, School, Vacations, etc. should be scheduled around the team's schedule. By signing your contract, you are committing yourself to the team and teammates. Therefore, because this commitment policy will be strictly enforced, if a position player misses 10% of the scheduled games, he will be dropped from the team. A player on the waiting list will take your spot. We do accept players, on a limited basis who need host families in the summer months of June and July. Host families will provide room and board, transportation to and from games and practices, and (2) meals a day. Cost per player: $500 per month to the host family. If you would like to host a player, please let Coach Leo know. See HOST FAMILIES TAB or CLICK HERE..
Once a player signs his contract to play summer ball, there are no refunds. 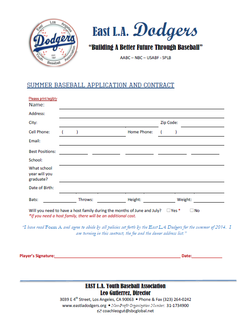 The East LA Dodgers are committed to providing quality opportunities for each of our players. This means we will play each player at each game (except pitchers). We have found out over the years that our system is fair, and still allows us to be competitive in league play. Our goal is to have each hitter have atleast (2) plate appearances per game, a minimum of 4-5 innings of playing time on defense. There are no starters or reserves in our system. Everybody plays. Starting pitchers are on an (80) pitch count or (5) innings. Relievers and closers will get plenty of innings and appearances. It is our goal that each of our players return to school in the fall as much improved, better and confident player who will help his school in 2018. Our collegiate program is called travel ball for a reason: lots of travel is required. Games are scheduled as far north as Santa Barbara, as far south as San Diego, and as far east as Palm Springs. All players are required to provide their own transportation to and from games. Distance is not an excuse to miss games. These fees must be paid when you turn in your contract. Also these fees only bring in about $12,000.00. The rest will have to be fundraised, which each player must participate in. We will run (2) tournaments this summer. Each player will be required to work the game, work the 50/50 raffles, etc. during the tournament. We will have an "All you can eat Pizza and Spaghetti" dinner fundraiser in which we will ask each player to sell (4) tickets. The date for this fundraiser is TBA. In order to participate in this opportunity, please sign the contract and return as soon as you can, along with the appropriate fee. Forms are ready for download. CLICK ON ICON BELOW TO OPEN DOCUMENT. PLEASE FILL IT OUT AND MAIL IT TO THE ADDRESS LISTED.